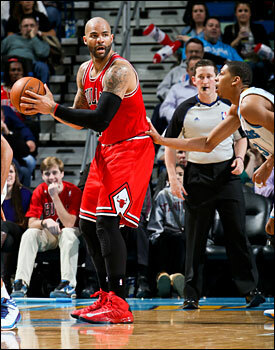 It was a tough, physical game for the Bulls Tuesday in their 96-87 victory over the New Orleans Hornets/Pelicans. “When we play with that kind of defensive intensity, 96 (points) is plenty,” said Joakim Noah, who had his team high 27th double-double, tied for second in the East with Al Horford behind Nikola Vucevic, with 15 points and 17 rebounds in addition to five assists and three blocks. Even with advanced metrics, no one is keeping stats for screens set. So assume Noah leads the East in that category. The Bulls front line with Luol Deng with a team high 20 points, Noah and Carlos Boozer combined for 52 points on 53 percent shooting and 32 rebounds, Noah’s 17 rebounds a Hornets/Pelicans opponent best. So like a tuneup before the heavyweight fight, let’s get ready to rumble! It was fun for the Bulls, in a sense, Tuesday with the season opening starting lineup of Noah, Boozer, Deng, Richard Hamilton and Kirk Hinrich back together again with Hinrich having missed the previous seven games with a damaged bursa sac. And you’d think he’d rather carry a wallet. Anyway, the Bulls went to 17-7 with that starting lineup, the best record of any of their fivesomes as they moved to 31-22. The Hornets/Pelicans are 19-35, though a dangerous team as they won in the United Center in November and then without rookie Anthony Davis, who put on a highlight show Tuesday with 15 points and 10 rebounds. They especially believed it was the case with the return of Hinrich, who despite just five points on two of seven shooting, energized the Bulls offense with 10 of their 30 assists on 39 baskets, drew a crucial offensive foul with 1:59 left that initially was called a foul and reversed on replay, got his usual technical foul though with a bit less frothing at the mouth this time and inspired the ball movement that had nine players attempting at least five shots and a high of 16 from Boozer. The shot Thibodeau was referring to was an All-Star type, the last chance defensive stop the Hornets/Pelicans had to make to have a chance to steal the game. The Bulls’ defense forced seven turnovers in the last six minutes of the game. But the Hornets had one last gasp after it seemed over when Noah banked in a left handed drive with 2:53 left for a 92-82 lead. Greivis Vasquez scored on a drive, Deng missed a three, and then the Bulls relaxed in transition allowing Eric Gordon, who led New Orleans with 20 points, a rare, wide open look to get within 92-87 with 50.9 seconds left. Thibodeau gathered the players in a timeout and said he wished they’d have hurried back sooner, though wasn’t it a beautiful day. OK, it didn’t go quite like that. But staying true to his next-moment-is-the-most-important-in-life philosophy, Thibodeau designed a nice play for Deng, who came off the double screens open and pulled up for a 15-footer with 44.8 seconds left to effectively clinch the victory. It wasn’t a dramatic buzzer beater. But it nonetheless was a pressure shot with a game that could have turned against the Bulls. It was an especially sharp start to the game for the Bulls with nine assists on their 12 first quarter baskets, four by Hinrich and two by Boozer as the Bulls took a 26-21 lead after one quarter, Hinrich’s penetration to close the quarter and pass out to Deng for a three a big play to end the first. And Noah may be closer than anyone on the team to Nate Robinson. No offense to Robinson, who started slowly but scored four straight points in the fourth quarter after the Hornets/Pelicans had a 7-2 start to the fourth to get within 76-75. But Robinson is not a natural running the offense, though he probably is the toughest guy on the team and took another hard shot to the face early in the game and walked it off. He takes probably more of those than anyone, and despite their size you’d be doing well to have Robinson and Hinrich in a tag team match for you. The Bulls stayed ahead, going up 47-43 at halftime with the Bulls reserves playing a strong quarter and Noah with some fancy playmaking late in the quarter. But rookie Davis from Chicago’s Perspectives Charter High School made several spectacular, athletic plays that have him stamped as a star once he puts on some weight and perhaps develops a bit more of a floor game. Though he doesn’t stay on the floor long the way he made three amazing plays up in the air in the quarter, the final one to end the half that left you shaking your head in admiration that you get a chance to watch a talent like that. With the Bulls starting to pull away ahead 37-28, Davis converted with one hand a lob pass from Vasquez that it appeared about to sail over the backboard. Then Davis went diving out of bounds and directed a pass back to Gordon for a three that caught the Bulls apparently thinking there was no way anyone could get to that ball. For me, the best was last, though Thibodeau seemed to take a somewhat dimmer view as he stalked off the court at halftime while Noah angrily slammed the ball down in disbelief. After a Hinrich jumper with 4.8 seconds left in the first half to put the Bulls ahead 47-40, Davis streaked downcourt. Vasquez spiraled a fullcourt pass with Davis whizzing by the speedy Noah. Davis appeared to have his back to the basket as he was flying past it and in one motion caught the ball and reached back and put it in with Noah fouling him for a three-point play with 1.6 seconds left. Bulls players didn’t know whether to curse or cheer seeing a play like that. No one said anything about Bulls coaches, or one in particular. Perhaps the Bulls as well as they got some hopeful signs Monday with Derrick Rose looking good in a rare five-on-five scrimmage the Bulls began having to accommodate Rose. Though Rose last week left open the possibility of not playing this season — and there is debate on both sides of the issue — nothing really has changed as he’s still on his same schedule and still awaiting the doctor’s recommendation on whether it is appropriate to play this season or not. And, if so, when and for how long. None of that has truly been addressed officially yet, and Rose at media day last October said it will be his job in rehab to prove to the doctors and the Bulls he’s fit to play without risk of further injury. That process, as it has for the last several months, merely continues. The Bulls came out of halftime continuing to put pressure on the Hornets/Pelicans with Hinrich sending New Orleans into a timeout down 62-52 with 6:42 left in the third after a pullup three. Then coming out of the timeout, Hinrich in the backcourt pretended to be stretching. And then when Robin Lopez inbounded the ball lazily, like most NBA players do, Hinrich jumped in to steal it, though the Bulls didn’t score in that possession. Still, it was a classic play. Hinrich is one of the more relentless guards in the league fighting over screens, which one of the officials, Sean Wright, didn’t seem to be able to get right. 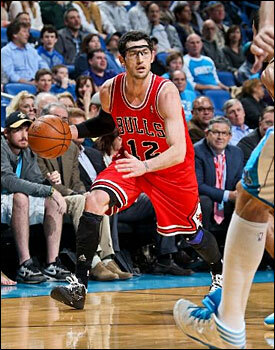 Hinrich isn’t generally hesitant to explain if he believes he can help the officials. And often he doesn’t quite know when to stop. So he picked up a technical, though was not truly frothing. “We’ve had… I’ll leave it at that,” Thibodeau stammered as he was about to discuss the Bulls’ confusion about some officiating before apparently recalling he was going shopping for more sweat pants this weekend. Hinrich ran a beautiful two man game with Boozer late in the third for a 71-61 lead. But the Bulls relaxed late again, giving up a three-point play on a runner to Austin Rivers and Taj Gibson fouling Ryan Anderson on a three with 3.1 seconds left as the Bulls lead was cut to 74-68 after three and almost gone. But if New Orleans with Davis was an irresistible force, the Bulls’ defense was that immovable object. And then something’s got to give. It was the young Pelicans-to-be. OK, nice preliminary. Time for the main event.